100% free of mineral oils and chemicals. Soft, supple and nourishes skin for your baby. 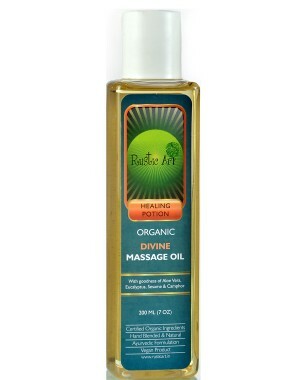 Perfect for body & hair massage. Take desired quantity in palms and apply on affected area. Rustic art divine massage oil is an age old ayurvedic formula. It is also called 'sarva roga nivarani' or the 'master oil. With goodness of aloe Vera, eucalyptus, sesame & camphor indulge in a traditional ayurvedic massage that would calm your senses and leave you rejuvenated. In case of cold, running nose, asthma (wheezing) and problems caused by humidity, apply 2 drops gently on the nose, eyebrows, throat and chest for instant relief. In case of joint pain and back pain, apply uniformly and massage gently. It is useful for respiratory congestion, cramps, swelling, body pain, sprains, paralytic disorders, hypertension, rheumatic disorders, insomnia, and facial paralysis. It can be safely applied on nose, throat and back if suffering from cold. It is completely handmade and has no side effects.